ALL-ITEMS: The latest figures on consumer prices released by the Statistical Institute of Belize show that, for the month of December 2017, the average Belizean Household experienced a one percent increase in the cost of regularly purchased goods and services. The All-Items Consumer Price Index stood at 105.1, an increase from 104.0 in December of 2016 (see Figure 1). For the year 2017, Belize reported an annual national inflation rate of 1.1 percent. FOOD & NON-ALCOHOLIC BEVERAGES and ALCOHOLIC BEVERAGES: During the month of December 2017, the ‘Food and Non-Alcoholic Beverages’ category saw little change overall, recording only a marginal increase of 0.1 percent when compared to December of 2016. This was, however, the net effect of an increase in ‘Food’ prices being offset by lower prices for ‘Non-alcoholic Beverages’. Increases in the retail prices of various items, including onions, sweet peppers, cabbage, ground beef and whole chicken resulted in a 0.4 percent rise in the ‘Food’ sub-category (see Table 1), while lower prices for coffee and tea led to a 1.8 percent decline in ‘Non-Alcoholic Beverages’. On the other hand, ‘Alcoholic Beverages’ saw an 8.2 percent rise for the month, due mainly to higher beer prices compared to December 2016 following the increase in excise taxes earlier in 2017. TRANSPORT: As was the case throughout the year, the ‘Transport’ category was the single greatest contributor to the overall rise in consumer prices for the month of December 2017, rising 6.2 percent when compared to December 2016. The ‘Fuel and Lubricants’ subcategory was up by 5.7 percent, with all types of fuel recording increases during the month. The price per gallon of Premium gasoline rose 11.8 percent from $10.18 in December 2016 to $11.38 in the same month of 2017, while Regular gasoline rose 13 percent from $9.25 to $10.45, and the price per gallon of Diesel was up 8.8 percent from $8.84 to $9.62 (see Table 1). International airfare prices also reported a significant increase of 33 percent on average, while domestic bus fare prices were 4.5 percent higher than they were during the same month in 2016. HOUSING, WATER, ELECTRICITY, GAS AND OTHER FUELS:Prices within the ‘Housing, Water, Electricity, Gas and Other Fuels’ category rose by 0.9 percent overall. This was due to a 0.4 percent increase in home rental costs coupled with higher Liquefied Petroleum Gas (LPG) prices. The average cost of a 100-pound cylinder of LPG rose by 18 percent, from $83.90 in December 2016 to $99 in December 2017 (see Table 1). INFLATION BY MUNICIPALITY: Across the seven municipalities surveyed, Punta Gorda Town recorded the highest increase in consumer prices. With a reported 1.8 percent inflation rate, this municipality had one of the most significant increases in ‘Food’ prices during the month coupled with an increase in the cost of household and domestic services. On the other hand, Belmopan City reported the largest decline in home rental costs, resulting in this municipality reporting the country’s lowest inflation rate for the month at 0.1 percent (see Figure 3). 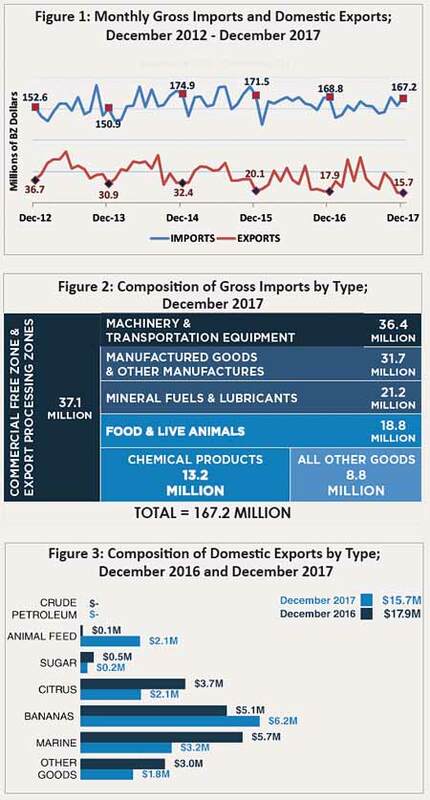 December 2017: During the month of December 2017, Belize’s imported goods were valued at $167.2 million, down by 0.9 percent or $1.6 million from the $168.8 million imported in December of 2016. The ‘Other Manufactures’ category recorded the largest drop for the month at $3.6 million, from $14.7 million in December 2016 to $11.1 million in the same month of 2017, the result of reduced purchases of light fixtures, plastic laboratory items and metal office furniture. In addition, importation of ‘Chemical Products’ and goods destined for the ‘Commercial Free Zones’ each fell by approximately $3 million. Diminished imports of fertilizers and medicines resulted in the decline in the ‘Chemical Products’ category, from $16.3 million to $13.2 million, while decreased purchases of cigarettes and handbags led to the drop in imports to the ‘Commercial Free Zones’, from $33.7 million in December 2016 to $30.7 million in December 2017. Likewise, the ‘Beverages and Tobacco’ category’ shrank by $1.4 million, from $5.2 million to $3.8 million, as importation of beer, soft drinks and vodka all fell during the month. Imports of goods meant for the ‘Export Processing Zones’, on the other hand, rose sharply by $3.9 million, from $2.5 million to $6.4 million, due mostly to heightened purchases of high pressure processing equipment for the month. The ‘Mineral Fuels and Lubricants’ category rose from $17.9 million to $21.2 million, largely owing to increased kerosene purchases, which tripled in comparison to December 2016. Imports of ‘Machinery and Transport Equipment’ went up from $33.7 million to $36.4 million due in large part to the purchase of a high value piece of transport equipment as well as plate bending machines. ANNUAL IMPORTS 2017:Merchandise imports for the year 2017 amounted to $1.8 billion, representing a 4.1 percent or an almost $79 million decrease from the total imports recorded for 2016. The year’s most notable decreases were observed in the categories of ‘Machinery and Transport Equipment’, ‘Other Manufactures’ and ‘Food and Live Animals’, which together fell by a combined $113.7 million. ‘Machinery and Transport Equipment’, which recorded the most significant drop of the three, declined steeply by $83.2 million, from $458.7 million for 2016 to $375.5 million for 2017, with telecommunication parts, four-cylinder vehicles and water sealing/ filling machines seeing the greatest decreases for the year. ‘Other Manufactures’ went down by $17.2 million, from $178.6 million to $161.4 million, as the country bought less prefabricated steel buildings, plastic bottles, laboratory equipment and sports equipment compared to 2016. Imports of ‘Food and Live Animals’ declined by $13.3 million, from $229.5 million in 2016 to $216.1 million in 2017, with reductions across various food items, such as soybean meal, wheat flour and coffee. On the other hand, due to higher world market prices for fuel in 2017, imports of ‘Mineral Fuels and Lubricants’ recorded a considerable increase during the year, growing by $28.7 million from $187 million in 2016 to $215 million in 2017. December 2017: The total value of Belize’s domestic exports for the month of September 2017 was $48.5 million, this was more than twice that recorded for September 2016, which amounted to $21.4 million. Marine products experienced the most substantial decline of all major exports, dropping by $2.5 million from $5.7 million to $3.2 million, as sales of shrimp fell significantly when compared to December 2016. Similarly, exports of citrus products decreased sharply from $3.7 million in December 2016 to $2.1 million in December 2017, the result of diminished orange concentrate sales. Bananas, on the other hand, performed positively during the month, with earnings from that commodity growing by $1.1 million, from $5.1 million to $6.2 million. Nevertheless, the largest increase in export revenues for the month came from Belize’s other exports, particularly animal feed, as earnings from that commodity surged from $0.1 million in the last month of 2016 to $2.1 million in the same month of 2017. As was the case in 2016, minimal sugar sales were recorded for the month of December 2017, and there were no crude petroleum exports in December of either year. Exports to the United Kingdom fell by $1.4 million, from $5.3 million to $3.9 million, as no shrimp and sugar were sold to that country in December 2017. The rest of the European Union, however, saw a growth in exports, from $2.3 million to $3.5 million, due largely to increased sales of bananas and grapefruit juice to that region. Export earnings from Central America rose sharply by $1.7 million, from $0.4 million to just over $2 million, owing mostly to strong sales of animal feed, while diminished orange concentrate sales led to a drop in earnings from the CARICOM region from $4.1 million in December 2016 to $2.7 million in December 2017. ANNUAL EXPORTS 2017: Merchandise exports for the year 2017 totalled $445.6 million, up 10.9 percent or $43.7 million from total exports of 2016, which amounted to $401.9 million. Accounting for a third of Belize’s total exports for the year 2017, sugar emerged as the country’s top export earner, as revenues from that commodity rose by 43.6 percent or nearly $45 million from $103.1 million in 2016 to over $148 million in 2017. While exported quantities for this product rose by almost 27 percent compared to the previous year, this increase in revenues also reflected more favourable world market prices for sugar during the year. Likewise, bananas performed strongly throughout 2017, recording a 17 percent increase in export earnings over that of 2016 as revenues went up by $11.9 million, from $69.9 million in 2016 to $81.8 million in 2017. Annual crude petroleum earnings were virtually unchanged compared to 2016, notwithstanding a 20.3 percent drop in exported quantities, as revenues were bolstered by more favourable world market prices in 2017. Exports of marine products fell slightly from $41.9 million in 2016 to $40.1 million in 2017, as greater sales of lobster tails and lobster meat partially offset the drop in shrimp and conch exports. In 2017, citrus exports declined steeply by $19.6 million, from $100.1 million to $80.5 million, as sales of orange concentrate for the year were significantly lower than they were in 2016.